Sorry but I disagree with all the negativity about this bar. 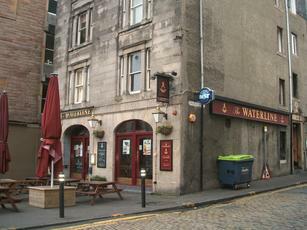 Considering it is located in Leith, the patrons are actually very nice, the bar staff are always friendly and the food is lovely. I've never had a problem with the service I've received. There is also live music on every Saturday night which makes it a lively experience. Yes the bar is small but that makes it cozy not 'cramped' and as far as the prices go, they're very reasonable compared with what you would be expected to pay in bar in town, for a much less pleasurable experience, I might add. Over priced bar with staff who cannot pull a pint. Mainly used by those who like to sit outside so, as you can imagine, it is a quiet pub in the winter. Never tried the food so cannot comment. There are so many of these pub/restaurants along the Shore that they all start seeming like each oher. Again the Waterline has a small cramped bar with a larger restaurant area up a few stairs at the back. I saw a Cask Marque sign that I thought was a bit generous given they only had two handpumps, one with the ubiquitous Deuchars and the other showing nothing. One advantage the Waterline has over other bars in the area is a nice outside seating area that I imagine is very popular in Summer. Great food at great prices. Never hard to find a table.